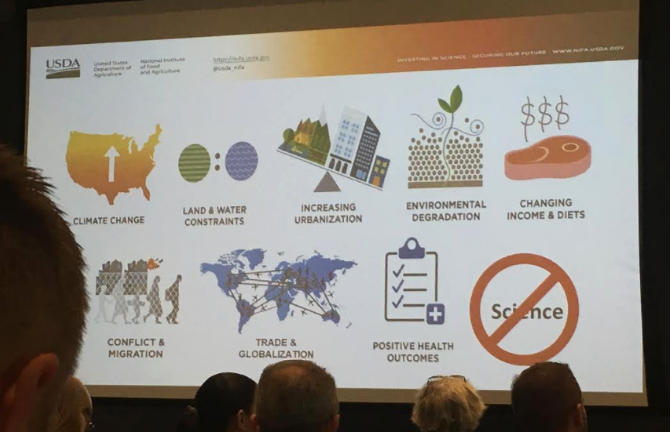 The AVF Summit in Washington D.C was a great event to get a very eclectic group of people together that all want the same thing: to feed people and grow food sustainably as we move into a future that is rapidly growing and urbanizing. Recent grads, farmers, politicians, and tech driven individuals all had a chance to discuss the future of vertical farming and urban farming including topics such as policy, certification, zoning, and the politics behind the future landscape of agriculture. The summit went into a lot of the bureaucracy surrounding urban and vertical farming and what it truly means to have a well thought out plan before you start growing. The day-long summit was separated into multiple sessions with presenters from across the urban farming and tech industries, including but not limited to Sonny​ ​Ramaswamy​ ​(The National Institute of Food and Agriculture), Dr​ ​Bob​ ​Whitaker​ ​(Produce Marketing Association), and Roberta​ ​Anderson​ ​(Global G.A.P.). Most sessions were accompanied by a Q&A panel of industry professionals, each having a unique perspective on the specific topic of that presentation. Starting with a focus on policy, followed by Standardization & Certification, and finishing the day with the politics behind The Farm Bill, the summit painted a broad picture of what the future farming landscape may look like. Much like the summit, the future of farming will be a combination of many different subjects and professions, with different skills, opinions and knowledge uniquely coming together to create the way we grow and eat. Hort Americas is proud to support this diverse industry. Working with every type of farm from conventional to vertical, our goal is to assist the industry with not only superior equipment and supplies, but with technical expertise and hands on experience. For more information on the Association for Vertical Farming, click here.